Busy as she has been with work, JPL's Dr. Joy Crisp, project scientist for the Mars Exploration Rover Project, found time a few weeks ago to do a little shopping. The new necklace she bought is a simple string of dark grey beads and wasn't expensive. What makes it significant is that it is made of specular hematite, which for Mars scientists like Crisp may prove to be more special than diamonds. On Earth, the shiny grey mineral has been used to make jewelry for hundreds of years. 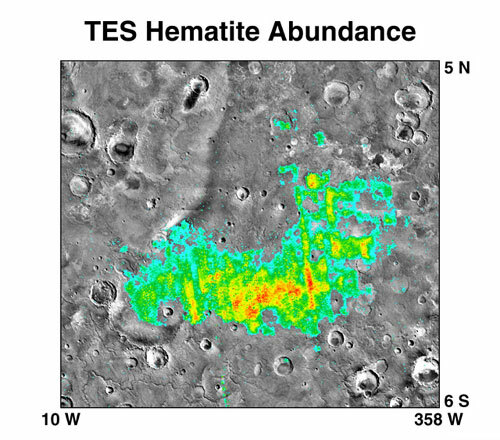 On Mars, grey hematite may help prove whether large amounts of liquid water ever flowed on Mars' surface. Where water was, life may have had a chance to thrive as well. Hematite is made up of iron and oxygen-a type of iron oxide. It takes its name from the Greek word for "blood," and is a rusty color in powdered form. Fine-grained hematite helps gives Mars its characteristic red hue. "Grey hematite is a mineral indicator of past water," says Crisp. "It is not always associated with water, but it often is." Deposits of grey hematite are typically found in places where there has been standing water or mineral hot springs, such as those in Yellowstone. The mineral can precipitate out of water and collect in layers at the bottom of a lake, spring, or other standing water. 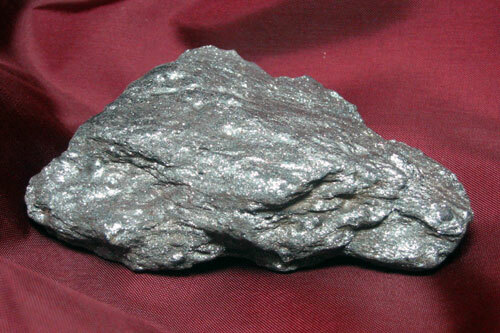 But hematite can also occur without water, as the result of volcanic activity. Scientists have wanted to find out which of these processes created grey hematite on Mars since 1998, when Mars Global Surveyor spotted large concentrations of the mineral near the planet's equator. This discovery provided the first mineral evidence that Mars' history may have included water. 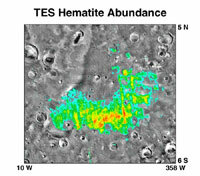 TES geologic map of Mars showing hematite-rich areas in red. If all goes well, they'll get a close look at Mars' grey hematite when Opportunity, Spirit's rover twin, lands this week in an area rich in the grey mineral. To find out what helped produce the hematite - water or volcanic activity - they'll be examining both the form of the hematite and the company it is keeping. "We want to know if the grains of hematite appear to be rounded and cemented together by the action of liquid water or if they're crystals that grew from a volcanic melt," says Crisp. "Is the hematite in layers, which would suggest that it was laid down by water, or in veins in the rock, which would be more characteristic of water having flowed through the rocks." "The area where we are going has 10 to 15 percent grey hematite," Crisp says. "What are the other materials found with the hematite? Clays and carbonates would indicate there had been water in the area. If the area had been volcanic, you would expect to see other types of minerals like olivine and pyroxene." The distribution of hematite in Sinus Meridiani, where Meridiani Planum is located. "We're very interested to know if this region could have been like Yellowstone, with hot springs, so we'll be looking to see if there are other minerals in the area such as those at Yellowstone." 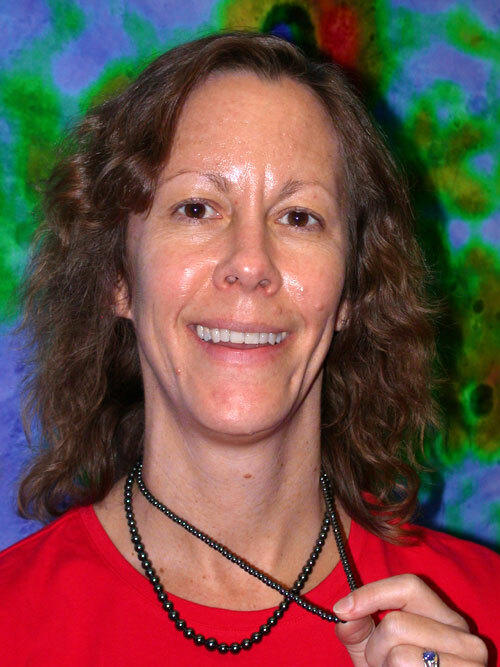 "Knowing just how the hematite on Mars was formed will help us characterize the past environment and determine whether that environment was favorable for life," says Crisp. "One big question, of course, is whether life ever started on Mars. This mission probably won't tell us that, but it may well lead to future mission that can answer that question." In the meantime, Crisp wears her newly acquired hematite necklace for luck.